The courtship period in mice displays surprising rituals. Researchers from the group of Prof. Denis Duboule show, indeed, that the female actively solicits the male’s advances, as well as mating. They also demonstrate that this courtship activity is under genetic control, as evidenced by the aggressive behavior of females issued from a mu- tant line. The latter chase the males and investigate their intimate parts relentlessly, before inflicting them genital bites. 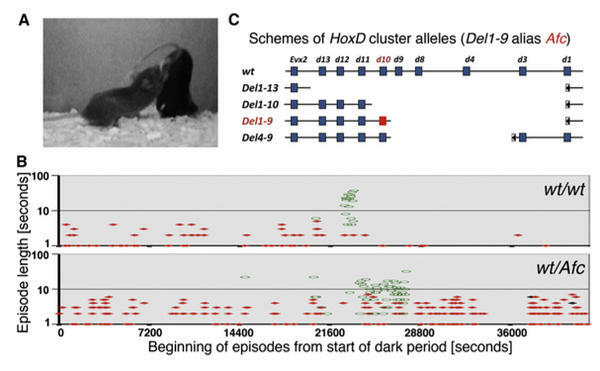 This behavior is associated with the deletion of a specific region in a group of genes named HoxD. The anomaly induces in mutant female brain ectopic expression of the Hoxd10 gene. The results, published in the journal Current Biology, open new avenues to explore genetic and molecular bases of normal and pathological mammalian affect.